At the 1955 Mille Miglia, at 7:22am, British racing drivers Stirling Moss and Denis Jenkinson set out on what was to be a historic run. Moss’ Mercedes-Benz 300SLR, though visually similar to the road-going 300SL “gull wing” car, was based heavily on Mercedes’ W196 Grand Prix car… despite this; the Italian teams were the heavy favorites to win, with a strong showing expected from the Porsche 550 team. The SLR, wearing the number “722” (indicating the 7:22 start time) won the race, and turned Stirling Moss into a legend. Some 50 years later, very little seemed to have changed. 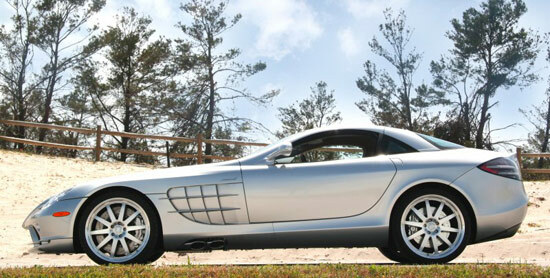 Mercedes McLaren’s 626hp SLR had barely seen the light of day before Ferrari’s Enzo stole the headlines. To make matters worse, Porsche’s flyweight Carrera GT arrived – with the Bugatti Veyron hot on its heels. 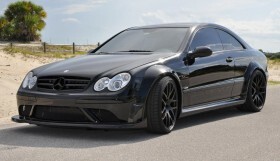 All of a sudden, the SLR was washed out in a wave of new supercar headlines. Mercedes decided the best response to this dilemma would be to invoke the spirit of Moss and the original Mille Miglia number 722, and released, in the summer of 2007, a special edition Mercedes-McLaren SLR 722… with 650hp. Such comments might be easily dismissed – but not when they come from Feyhl. 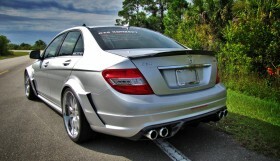 No stranger to high-performance, Feyhl followed up his 12 year run at AMG by forming RENNtech – a tuning house generally regarded as the nation’s foremost authority on Mercedes-Benz performance. The RENNtech crew began with a comprehensive review of the SLR’s stock components, when attention quickly focused on the car’s intercooler. “The stock intercooler wasn’t doing the job,” Feyhl explains, “it needed an upgrade”. 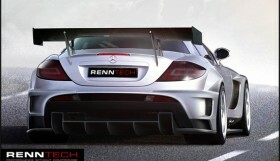 The improved cooling meant that RENNtech could shift their attention to the supercharger and pulley – a RENNtech pulley kit, enhanced by RENNtech’s own SLR specific software tuning, increased boost to the SLR’s 5.5 liter V8 and produced an astonishing (but coincidental) result: 722hp – which might mean a lot more to McLaren customers than 7:22am.